In order to see what these could do for them we did some loadtesting. The upgrade to a higher patch level of SOA Suite was needed at least to get the ESB working correctly with the configured number of listeners. However because of some issues running Oracle Universal Installer there wasn’t any time left to verify that the patch resulted in increased performance. For functional and application management reasons turning of logging was not considered an option at this stage. For each ESB System the number of listeners can be configured. These listeners are used to read from JMS topics. If there is only one listener (which is the default) message are read from the JMS Topic one at a time. The first screenshot shows where to set the number of listereners using the ESB Console. 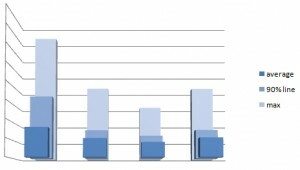 To determine the optimum number of listeners for the specific ESB, OS, hardware combination we did some loadtesting. 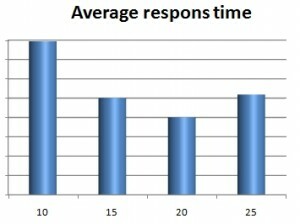 The results for the average response time are shown in the next screenshot. As expected the respons time increases at a certain point when the number of listeners is raised. “Time out” messages are never created by averages. While this first graph looks great and is very convincing, we are even more interested in the 90% and maximum respons times. A chart for these statistics has been included as well. Analyzing this graph one can conclude that this has an even stronger support to set the number of listeners to an appropriate level. From this experiments it can be concluded that the response time can significantly be reduced by setting the number of listeners of an ESB system to the appropriate level. The maximum respons time has can be decreased by over 50%. This has a significant impact on the availability of the services exposed using the ESB. 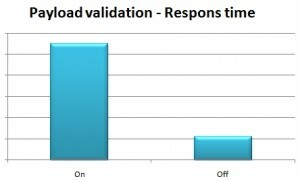 Another idea to enhance the performance is to turn off payload validation. Needless to say that this also has functional aspect. In most cases the validation that is performed here has some kind of business (related goal), like data quality. To switch it off, has impact, and the validation has te be migrated to some place else in the software. The performance results can be dramatic. In a positive way! As is shown in the figure on the right, the respons time can be reduced to a fifth of the original. This goes for both the average and the maximum respons times. 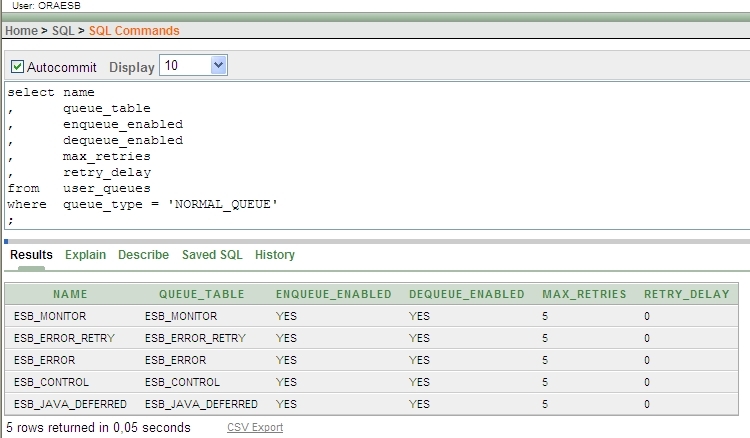 If you can change your service so payload validation at this point is no longer required, this is a great step in enhancing the Oracle ESB’s performance. This entry was posted in Oracle, Service Bus, SOA Suite and tagged ESB, Oracle, performance, queue, Service Bus on 2009/09/07 by PeterPaul. This entry was posted in Database, Oracle and tagged Advanced Queueing, JMS, Messaging, Oracle, queue on 2009/07/31 by PeterPaul. What is in the queue? One of our customers asked me exactly this question. They have an Oracle ESB and it seemed that it could not handle all incoming requests. With the queues being a decoupling point between the incoming requests and the related transactions to the back office systems, its size can be an indication of just how busy the system is. As I couldn’t find the answer using the Oracle Enterprise Manager Oracle Enterprise Manager and its MBeans, I started to look on the web for a tool. The tool I found and started to use was HermesJMS. This helps you interact with JMS providers making it easy to browse or search queues and topics, copy messages around and delete them. The HermesJMS requires Java 1.6. It has a clear installation guide installation guide and it is tested for multiple JMS providers. Besides the guide we needed for the Oracle AS there is also another blog describing the install and use of HermesJMS. Using HermesJMS we were able to answer this customers question. This entry was posted in Oracle, Service Bus, SOA Suite and tagged AS, ESB, HermesJMS, JMS, queue on 2009/04/16 by PeterPaul.